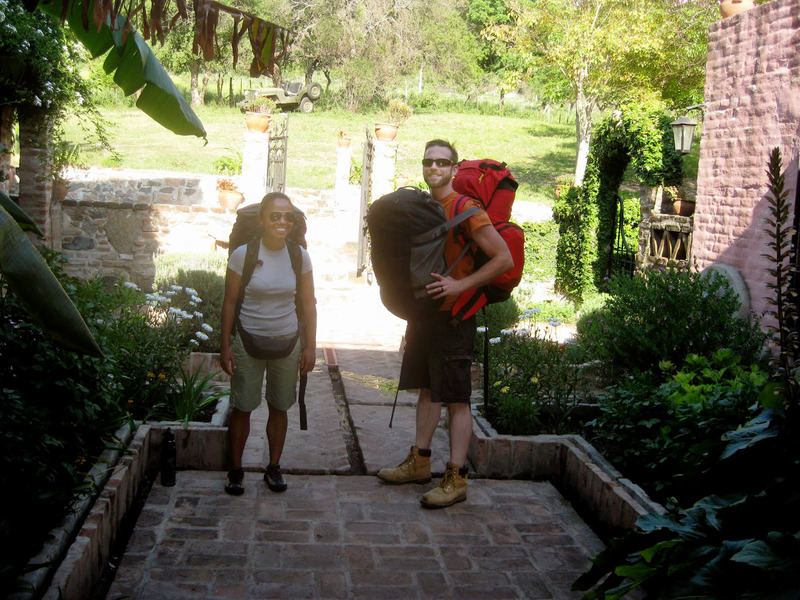 Neke and Jeremy Wyble are searching for the perfect homestead and permaculture site. They are exploring different places around the globe they are “WOOFing it” to learn about the World Wide Opportunities on Organic Farms and honing their skills as gardeners living a sustainable lifestyle. Check out their blog at the Wayfaring Wybles where you can follow their adventures! Jeremy: First we met in 2013, taking a course in permaculture, we got married a year ago and moved to a place in NE Pennsylvania in a place called Sullivan County, where my family has vacation cabin land. It is a great opportunity to learn, and test run a homesteading lifestyle, sharpen our skills and learn more about organic gardening. Neke: We’re also experimenting with some new techniques. We’re doing the homestead thing while we live here, but also in-between we’re traveling in search of our own homestead land, and as we travel, we’re doing WWOOFing. It’s basically program where people go onto organic farms or homestead, or community gardens, and you get free room and board for a few hours of work a day, and when you’re work is done, you have free time to yourself to explore the location and that’s the time where we’ve been looking for our own land where we would like to homestead some day. It’s been great. Jeremy: It’s more economical for us on a tight budget and we get to play in the garden, while we’re sear ching for land, and it’s been a great experience. Neke: Highly recommend it to anyone who’s interested in gardening and also traveling. Tell us about one of the places you went to as a WWOOFer that was super exciting. We had the luxury of a 3 month stint in Argentina, all the way to the Patagonia region of the Andes Mountains, so that was incredible. Rio Rasol … Surreal, see these beautiful mountains. Each country has sort of their own WWOOF program, there’s WWOOF USA, WWOOF Argentina, WWOOF Australia. You get a membership, you pay for a membership for these programs within each countries. You get a list of WWOOF hosts, you read the description of the type of work you will be doing, then you get in touch with the host and see if it would be a good fit, and also about timing, and how long you’re intending to stay, that sort of thing. We decided on 3 months, when we got married, Jeremy was hell bent on moving to Patagonia, beautiful country, amazing climate, we can go, but we can’t go for 2 weeks we need to really be immersed in it, to see if this is a place that your interested in truly living. So 3 months seemed like an appropriate length of time. First, I have to say, Jeremy didn’t speak any Spanish so I was sort of stuck with my broken Spanish. Red light right there! So we did that. Needless to say after the 3 months as beautiful as it was, our plans changed, this might not be the place for us, we might need to go somewhere where they speak English. Jeremy: We’re thinking our next adventure will be New Zealand, we’ll see how it goes. We ended up WWOOFing up at many different locations which they spoke English, so that limits our ability to practice Spanish. No we bounced around, different parts of the country, I think 5 WWOOF sites total. Argentina, is so big. We also wanted to see as much of it as possible . I knew one friend, but he wasn’t there, he was supposed to be there, but he wasn’t but he opened his door and we hung out with his family for a couple of days and had a great time, in Cordoba! But other then that no. No cell phone, made it a nice interesting adventure. Taking a bus, 20 hour bus trips, all over the country! The bamboo retreat? North of Buenos Ares there’s a river delta where the whole community is only accessible by small boats and canals, we ended up WWOOFing there for a week, it was a bamboo operation, we’d go out with machetes and wack down bamboo and manage it into a nice grove. That night it rained and poured and we totally understood, so we took this little boat ride around the property in the middle of the night! What was once a lawn is now a lake, It was crazy bizarre! We still had to get (drinking) water. Jeremy – My first active gardening role, was only about 6 years ago, growing peppers after that I decided to double his garden, that was in NJ. Neke: I grew up in NYC, there are so many community gardens popping up. Urban kids When I was growing up I didn’t have those opportunities. Through a volunteer program, with an organization called NY Cares, through a magnet school that focused on the Environment. Each time I would show up for these volunteers and I would observe the excitement these kids. How ago tI plant this little window box. How about I plant a window box, I did not have a green thumb, I tried some basil, some thyme, some flowers. They didn’t do very well, they need to repot, they need room to grow, and it got better after that. We have a slug problem, and we’re reading this Permaculture book and in it the author Bill Mollison, says “You don’t have a slug problem you have a duck deficiency problem.” The idea with permaculture is working with nature, Rather then turning to chemicals or man made solutions, you find something else, in nature that will solve your problem. The ducks naturally love slugs. You don’t need to get them to do anything else, its what they naturally love to do. So how many ducks are you gonna get? Neke: I think 2’s enough. Jeremy: I want to get a handful, but we’ll see how that goes? I have to erase the guilt of hand picking and destroying all these slugs at night, I need to see to a more useful application as apposed to just burying them in wood ash. How do you keep the ducks from keeping the veggies in the garden? Neke: We just got chickens a few weeks ago, and it’s been, I think Jeremy’s enjoyed it more then I have, chasing them out of the garden. Do you have them in a pen or the garden fenced? Jeremy: The majority of the garden that we’re growing most of our veggies is fenced. So the idea is the ducks will stay out on the edge to, from what I read the slugs like to eat the ducks droppings more then your veggies so they’ll be lured outside the fence by the ducks droppings there, so it’ll be a nice cycle there. We’ll see how it goes. Who or what inspired you to start using organic techniques? How’d you guys even find out about the WWOOFer program? Jeremy: When I first started gardening with my dad, I was under the impression that you had to add fertilizer,so the plants would thrive, it wasn’t until you added fertilizer they would shoot up and start producing. But then I learned about Permaculture Principals, and that you don’t need to use chemical fertilizers to obtain yields, and how important it is to have a holistic approach to gardening. If you want to eat nutritious foods from your garden, all the parts of your garden need to be healthy as well… the water, the air, the soil. It’s hard to pinpoint a person that inspired me, but I think I gotta contribute Permaculture Principals. Neke: I don’t really know what inspired, I guess when I became interested in gardening, organic was the only kind that made sense in my mind, if your interested in growing your own food for nourishment, and nutrition and health why would you do anything else but organic? Last year we started quite a few beds, so last year was the first year planting in these beds, and the tomatoes just thrived. Amazing year for tomatoes last year, but ironically the other night shade family members peppers and eggplants didn’t do anything in the same beds. This year the Arugala and Valerian are doing very well this year? What do you use Valerian for? Valerian is a medicinal herb. We use the roots to make tinctures, which helps, it’s a sleep aid at night, helps you relax. The Valerian Flowers you can make an infusion to put in your bath water after a long day in the garden, it’s really relaxing and it smells amazing and the pollinators love it! It’s over 6 feet tall right now! With white flowers – umbels. What makes something a night shade? I had never heard that term before I heard it on a podcast the other night? I believe it’s the category of latin family. Learned mostly through companion planting, separating your night shade and your brassica, the brassica being your cabbages, cauliflower and broccoli. To a degree, some can be antagonistic to each other, as opposed to aiding them, they put out different exudates in the soil, and they come in conflict with each other at times. They attract different soil members that will create problems or diseases with others, so we’re just learning about it as of last year, and we’re experimenting, and trying to understand ourselves. Jeremy: We’re adding a few hops rhizomes, so we got some of those growing. A lot of different seeds herbs, such as sesame, caraway, flax. Neke: We started cultivated mushrooms, too. We inoculated some logs this year, that’s exciting! What does that mean to inoculate some logs? We did Pearl Oyster Mushrooms on Ash and Maple. So you drill holes in logs, then you put the dowels in, you hammer them in with a rubber mallet, then you put some wax over the dowels to protect them from bacteria, then set it in a wet shady place, and wait a few months, 6-7 months (Be patient) for them to fruit into mushrooms. One of the founders of Back to Your Roots Nikhil Arora was on Entrepreneur on Fire episode 65. You can hear Tim Nichols’s talk about growing organic hops in Episode 6 of the Organic Gardener Podcast. We’ve had trouble with spinach, and Neke loves spinach, but we’ve had trouble with it germinating, and for whatever reason it didn’t germinate maybe the slugs got it, but we didn’t get any spinach this year. Something that you find is easy to grow and generally successful every-time. Neke: Mustard greens, I don’t know where they came from, we put them in, but every year they keep coming back, they’re delicious! Amazing! the variety we have is called Osaka Purple. It’s just salad mustard, goodness! Jeremy: They self seed so easily, just like cilantro, so once you let them, once they bolt if you let them go to seed, they’ll keep coming back up, they tend to travel and they’re coming up everywhere. Neke: It’s my kind of gardening, I love it! Jeremy: Ours didn’t start self seeding this year until I took the mulch layer off so maybe they need light. With climate change everything is sort of unpredictable, what will grow well today might not next year, who knows. I would say if you like eating something try growing it, grow something you want to harvest and consume. Just try. Since our stints were only like three weeks, but we hear, down there the three sisters bed, did really well, the corn, beans and squash. Neke: Another companion planting thing we took with us and tell everybody with us. Three sisters part of plants that do well together. So in this case we’re talking about corn, beans and squash, each one helps to support the others two. Jeremy: the needs, either the squash providing a mulch layer at the base. Corn growing just nice and tall, that the beans can theoretically just climb up, I believe it’s sourced back to the Native American’s approach. Now is it green beans? I always thought it was pinto beans or kidney beans, does it matter? Especially beans, the legumes are putting nitrogen back into the soil, which the corn and squash need. Neke: Weeding, omg, sometimes getting out of bed in the morning, you’ve got a long day to look forward to, I’ll only do 2 hours today, sometimes that’s all it takes, and then your out there and the time goes by, so it’s just getting out there. Jeremy: I don’t mind the weeding, I don’t care to harvest too much, then I have to prepare it. I’ll take the weeding and you can do the harvesting! Sure, it’s fairly rural, there’s total of 37 acres, but we’re just focusing on zone 1, the garden we have maybe 8 different garden beds, maybe 100 square feet that we’re cultivating. We’re trying to establish a food forest, a little nuttery, some tree crops, that are natural investments, since we plan to move on, not stay here forever. A lot of hands off, cultivation of tree crops so you don’t have to maintain them as vigorously as a veggie garden. Then we’ll have hazelnuts for years. Collecting hazelnuts and filberts, they’re small shrubs. They get 15 -20 foot tall. From what I gather, this is a nice sweet spot for them. What are your favorite activities to do in the garden. Jeremy: I love to simply observing the growth of the garden from day-to-day, and seeing the soil build over time. Putting your hands in the soil and seeing all the life and till advancing. Neke: I love going out there with my camera, and photographing the gardens progress, and taking pictures of the details, through a camera lens the things look even more beautiful, the flowers when the buds first come up, those little details. The mustard greens. Oh and the fruits are coming up, the golden raspberries. I love just picking and eating. We stayed with this family down in Argentina, this old couple had this 2 acre homestead, and we’d be out there trying to get things done and he would say “slow down“, take a moment to appreciate what’s going on around you. Jeremy: Absolutely,it’s nice small and compact. We would have nothing growing, without my head lamp! For the graveyard shifts, on slug duty or getting the Japanese beetles off the vegetation. You can’t garden without it! Neke: I would say a shovel! You can’t garden without that! Jeremy: It’s a close tie. Jeremy: We know what you mean, it’s heart-wrenching to see surplus go to waste like that. We tried to overcome that with fermentation. We fermented some radishes a few years ago, it turned out amazing. We didn’t really care for the radishes at the time because the flavor was so sharp tasting, but through the fermentation it kind of just dissipated, so we are really just tinkering with different kinds of fermentation as opposed to the traditional canning or jarring. Neke: I just started canning last year, the idea of all the water and the heat, compared to fermentation, not to say that I wouldn’t can again, but I probably wouldn’t do as much canning as I did last year. I would probably ferment more. Fermented food is more nutritious. There’s research that says the health of gut is determined the health of our body and fermented food will sort of undo some of the damage that we do to it with processed foods. Theresa Loe does an excellent episode on Pickling on her show Living Homegrown. Our sauerkrauts, you have to keep checking on it, for sure, to make sure they don’t spoil, if you don’t have a good crock that has a good seal, if you are make-shifting crocks with mason jars and what not you have to keep an eye on it and clean out the bacteria on top. It’s more maintenance then just canning once and putting it in the cupboard for the winter. We freeze some herbs, I would love to get a dehydrator and start drying this year! About any tips to freeze herbs? Wash em off, make sure they are dry, wrap them in a paper towel, and put them in zip lock freezer bags. Also putting them in ice cubes that works too. I just learned about garlic scapes, last year, that was weird and strange to me, so I just made it into a pesto. That’s what I do with things that are weird and strange. Let’s try making a pesto out of it. What other things have you made pesto out of? Jeremy: It’s a woodland perennial/annual, it’s a noxious weed that’s taking over the NE here, displacing a lot of native plants, they just grow in massive clumps, so there’s no easy harvest, a lot of people just pull em out and just burn them, but they’re totally edible. We harvest them and made pesto out of them, really tasty. We put walnuts in it. Salads? Whatever greens are ready and available. What about on one of your adventures? In Bariloche, down in Patagonia, we had rice one night, and it was pretty good, but there was a lot leftover, the next night we had rice again which I don’t mind, but she took them and made sort rice balls, and fried them up, it was something I had never had before, they had kind of a crunchy outside and soft gooey rice in the middle. Neke: I’m really interested in Herbs, there’s one book here, I have it in front of me, it’s pretty extensive Rodale Press – Growing and Using the Healing Herbs. Goes through the history of how herbs have been used in different cultures, how to make salves tinctures. Enter the 2015 Gardening Challenge Today – open until July 4, 2015! Neke: So, it sounded like a 2 part questions, the first one, the way to create a greener world, is by offering more opportunities for young people to get outside and be with nature and really learn about food that it doesn’t come from a box on the grocery store shelves, it comes from the ground and soil through cultivation. So I think, it’s a growing movement, at least what I see growing up in NYC and seeing all these school gardens popping up. It’s a step in the right direction to see younger people more involved their own nutrition and their own health. Most crucial issue facing us, is the lack of willpower for a lot of people to reduce their energy consumption. I think it’s really easy to view things that are luxuries as needs now a days, especially on the part of more developed nations, on a local level it’s what you do at home its turning off the light switch, on a national level, where do we get our energy as a nation, and on a global scale it’s thinking about people in other nations that suffer so you can continue to have the standard of living you have. Jeremy: Everything’s so interdependent, there are so many issues that we face, its a very unique time, in the history of humanity it’s tough to solve one because there’s so many. But the energy crisis, as Neke pointed out, if you can isolate one, it would probably be that one. The total impact of all our energy desires and needs what it will have on future generations if we ould be a little more conscious of that, that would give us a greener world! “Live a life that you don’t need to vacation from” Rod Pinel sr.